Las Vegas, Nev. — The Regional Transportation Commission of Southern Nevada (RTC) has announced that the RTC 2012 Viva Bike Vegas Gran Fondo Pinarello Presented by Vector Media being held on Saturday, Sept. 22, will now include a 102-mile century ride in addition to a 17-mile ride, 75-mile ride and the 122-mile Gran Fondo. Five-time Tour de France champion and two-time Giro d'Italia winner Miguel Indurain committed today to riding in this year's event. The 1996 Olympic Time Trial winner “Big Mig” will ride under the bright lights of the world-famous Las Vegas Strip to the vistas of the Red Rock Canyon National Conservation Area and the scenic trails near Lake Mead National Park. Century, 75-mile and 122-mile Gran Fondo riders will have the additional opportunity to ride over the historic Hoover Dam. The RTC 2012 Viva Bike Vegas Gran Fondo Pinarello Presented by Vector Media attracts cyclists from across the country and around the world. The event's three official hotel sponsors, Mandalay Bay Resort and Casino, Monte Carlo Resort and Casino, and Staybridge Suites Las Vegas, offer cyclists traveling to Las Vegas for the fifth annual event discounted room rates. Pinarello, the world-renowned bicycle manufacturer, has also been announced as the official sponsor of this year's event which is presented by Vector Media and being held in partnership with Interbike (interbike.com ), the largest bicycle trade event in North America. Viva Bike Vegas will occur at the conclusion of Interbike which gathers more than 1,100 cycling-related brands and close to 24,000 total attendees annually. Registration is $105 for the RTC 2012 Viva Bike Vegas Gran Fondo Pinarello Presented by Vector Media and you can register online at http://www.vivabikevegas.com. Proceeds from Viva Bike Vegas will again benefit local charities: UC San Diego Nevada Cancer Institute, After-School All-Stars Las Vegas and Communities in Schools of Nevada. 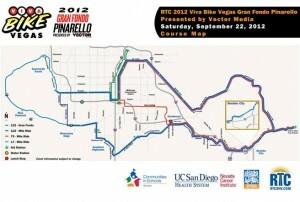 Map of the four cycling routes for RTC 2012 Viva Bike Vegas Gran Fondo Pinarello Presented by Vector Media is below.